The NRLT Nature Play Space in Blacksburg’s Heritage Park got a new installation recently of a child-sized birdhouse. The house was a community effort funded by the Rotary Club of Blacksburg. Ed Tuchler of Shelter Alternatives designed the birdhouse, and it was built by a team of volunteers from Shelter Alternatives, the Rotary and the community in just one day. The purpose of the birdhouse is to encourage nature play and wildlife awareness. The birdhouse has a viewing hole on one side that can also be used as a bird blind. The birdhouse is a wonderful new addition to the Nature Play Space, which includes benches, stones, a sand pit, an arbor, birdhouses (for birds) and a pollinator garden among the trees in the park. Access the Play Space from the Glade Road parking lot, 2300 Glade Rd. 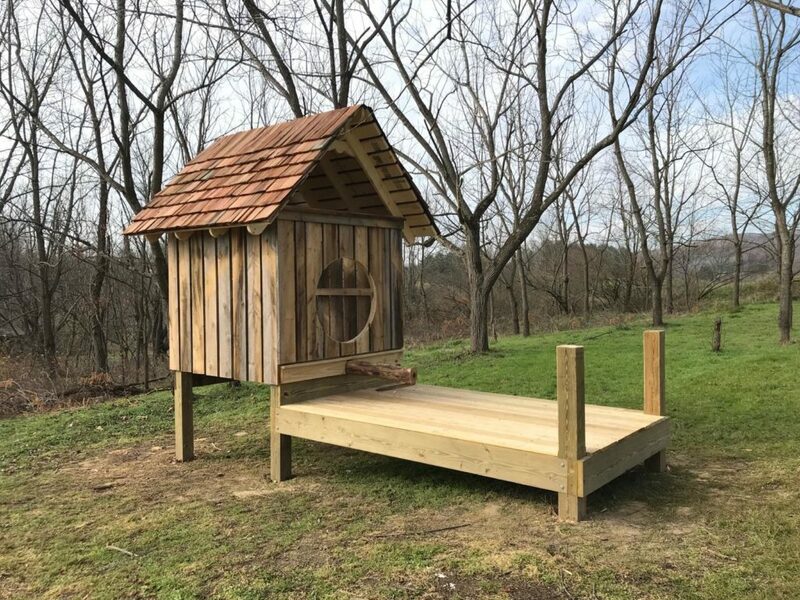 The post Nature Play Space Goes to the Birds appeared first on New River Land Trust. This article has been featured on our site to highlight the news and updates from our members. The original source can be found on the New River Land Trust website. View the original article here Nature Play Space Goes to the Birds.